Shrubs or trees, 10–70 dm. Stems of current year puberulent. Leaves glabrous except for puberulent rachis; rachis (including petiole) 9.5–21 cm; petiolules 1–1.5 mm; leaflets 17–35, abaxially pale green, adaxially olive, oblong to elliptic, 5–8(–10) × 14–19 mm, apex rounded. Racemes pendent; staminate-flowered racemes 7–15 cm, puberulent; pistillate-flowered racemes 7–10 cm, pubescent. Pedicels: staminate 1.5–2 mm; pistillate 1–2 mm. Staminate flowers: sepals 5, ovate, 1.5 mm, puberulent; petals 5, filiform, 3–3.5 mm, narrower than filaments; intrastaminal discs lobed; stamens 5, filaments 2–5 mm; pistils vestigial. Pistillate flowers: sepals 5, ovate, puberulent; petals 0; intrastaminal discs circular, thin, unlobed; stamens 0; pistils 3-carpellate, ovate, flattened, 2–2.2 × 1–1.4 mm, pubescent, stigmas unequal, 2 at apex of ovary, divergent, 3d slightly more proximal along medial line of pistil, sometimes only distal 2 stigmas present, 1 larger than other. Samaras stramineous or purplish tinged, flattened, (8–)10–12 × 2.7–3.2(–4) mm, dry, margins ciliate, puberulent; pedicels 6–10 mm. Phenology: Flowering and fruiting year-round. Fla., West Indies (Bahamas, Cuba). In the flora area, subsp. psilophylla is found in Miami-Dade County. Specimens of subsp. amorphoides from Mexico and Central America are, in general, more robust with longer, narrower fruits. Plants of subsp. amorphoides occur in a wider variety of habitats and are not obligate on limestone formations as are those of subsp. psilophylla. 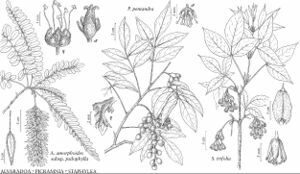 Facts about "Alvaradoa amorphoides subsp. psilophylla"